In a groundbreaking show of support for the planet and future generations, the Berkeley, CA City Council unanimously passed an ordinance focused on reducing waste and limiting single-use plastic on Tuesday, Jan. 22. The Single-Use Foodware and Litter Reduction Ordinance will be fully implemented by January 1, 2022. A phase-in plan begins Jan. 1, 2020. Community supporters filled Council chambers and cheered for the local elementary school students, who were dressed in vests attached with single-use plastic items. The students delivered speeches to garner council members’ support. Martin Bourque, executive director of Berkeley’s Ecology Center and chief strategist for the ordinance, noted, "We cannot recycle our way out of the disposable foodware problem. We have to focus on reduction." Backed by a coalition of more than 1,400 local, national, and international organizations, a lineup of speakers in support of the measure addressed council for almost two hours. Supporters included Plastic Pollution Coalition (PPC) members and partners UPSTREAM, The Story of Stuff Project, the GAIA (Global Alliance for Incinerator Alternatives), Steelys Planet, and the Surfrider Foundation, among others. A letter of support from PPC Notable Member and chef Alice Waters was mentioned during remarks. Speakers included Annie Farman, a PPC Executive Advisory Board member, who worked closely with the business community to garner letters of support; Sandra Curtis, PPC’s Director of Innovative Projects, who focused her remarks on the health risks of single-use plastic from exposure from foodware; Annie Leonard, founder of The Story of Stuff Project and current Executive Director of Greenpeace USA; Angela Howe, Legal Director of Surfrider; Samantha Sommer, Waste Prevention Manager, ReThink Disposables, Clean Water Action; and Miriam Gordon, program director for UPSTREAM; in addition to members of the community. Miriam Gordon, program director for UPSTREAM speaks to City Council in favor of the ordinance on Jan. 22. A packed room at the City Council meeting on Jan. 22. A press conference held earlier by Ecology Center on April 24. Teacher Jacqueline Omania with 3rd graders speaking at a press conferences in favor of the ordinance on April 24. At a press conference held by Ecology Center, a day’s worth of single-use plastic trash is visible. Council member Hahn explained the need for the ordinance. Single-use disposable foodware and packaging (SUDs) - including plates, cutlery, cups, lids, straws, “clamshells” and other containers - are a major contributor to street litter, ocean pollution, marine and other wildlife harm and greenhouse gas emissions. The use of disposable foodware has grown exponentially over the past few decades. Because the environmental costs of these products are largely hidden to the business operator and consumer, little attention is paid to the quantity of packaging consumed and quickly thrown away. 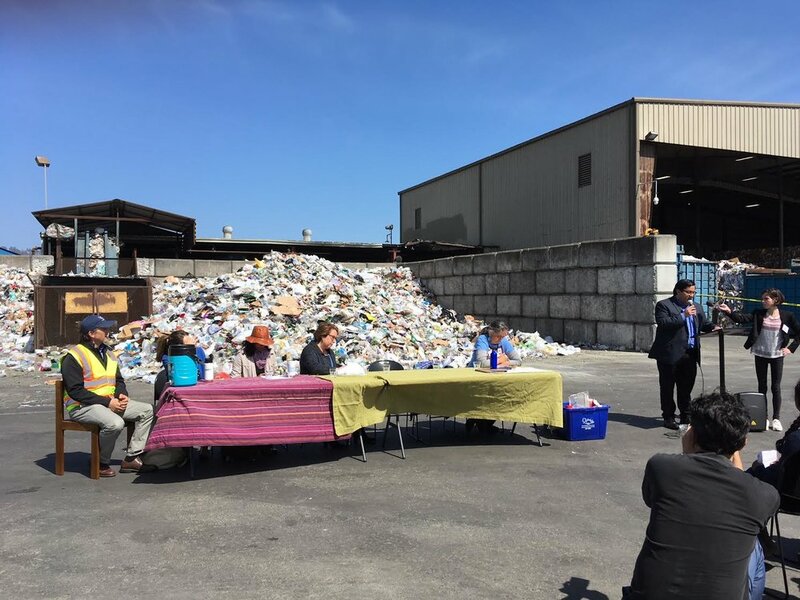 Reducing the use of these products in the City of Berkeley is a key strategy to achieve the City’s Zero Waste and Climate Action goals, and to address the many environmental impacts and costs associated with the use and disposal of single-use foodware and packaging. SUDs often become litter; therefore, minimizing their use will assist the City with achieving storm water program requirements and could reduce costs for maintenance of full trash capture devices that the City has installed in storm drains. Initially introduced to Council last April, the ordinance was referred to the city’s Zero Waste Commission who held four public hearings and collected comments from over 60 restaurateurs, environmental advocates, members of the people with disabilities communities, and other community members. This information was used to revise the ordinance. While recognizing that change is difficult, Hahn stressed that the business community is their partner in this effort which will save the City and businesses money. The ReThink Disposables program under Clean Water Action provided data to demonstrate cost savings to businesses. City officials validated that they would be able to work within the Zero Waste budget allocation to implement the program. Accessory Disposable Foodware (forks, straws, lids, condiment packages and other small disposable items) will only be provided by request or at self-serve stations. Food vendors may refuse to fill unsuitable or unsanitary cups provided by customers. The City of Berkeley may only purchase and use reusable or BPI Certified Compostable foodware at its own facilities and City-Sponsored events. Food Vendors that allow self-bussing will be required to provide three color-coded bins labeled for recyclables, compostables, and other waste. Disposable Foodware will be required to be BPI Certified Compostable (the City will post a list of suppliers offering compliant foodware). Food vendors can seek waivers to use recyclable alternatives for foodware items not available or reasonably priced in compliant compostable formats. Food vendors will show a charge of $0.25 for disposable hot and cold cups (total price of the beverage can remain the same or increase - the charge simply must be broken out, and if a customer supplies their own cup, the charge is not applied). The charge must be visible to customers on media such as menus, displays and receipts. Food vendors offering eating “on the premises” (eat-in) may only use reusable foodware (durable/washable) for eating-in. Food vendors may either provide cleaning and sanitation facilities on-site or contract with a service (similar to a linen service) for off-site cleaning. Technical Assistance and Mini-Grants will be available to support food vendors in establishing new facilities and practices to meet reusable eat-in foodware requirements. Hardship waivers will be available. The spirit of this legislation is to partner with food vendors to make transitions workable - and effective. Implementation is phased, and enforcement of each phase will focus on helping businesses make the transition. All enforcement must be preceded by a notice of non-compliance and the opportunity to cure or to request a waiver, and receive technical support.